I posted a little while ago about Aaron Kerchner winning the NoMo Tournament a little while ago. Since then I have had the chance to talk to him a little more about the fishing and what he did to get his win. First off, he showed me a link to a short article about the tournament in Kayak Angler Online, click that link to read the article. The tournament took place at Union Reservoir, a 736 square acre body of water located near Longmont, Colorado. The small size of the reservoir made it an ideal fit for the hand powered craft used in the tournament (NoMo stands for No Motor). Aaron said that the relatively featureless bottom of the reservoir led to several key pieces of structure coming into play as the contests made their way to where the fish would be. Aaron stated that he started out trying top water lures and spinner baits, but the fish just wouldn't bite, in part because of the high water temperature. He recognized that the fish were feeding on plentiful bait fish and he decided to switch to a jig head and worm combo, pictured at right. The worm is an Xcite Baits Slim X in green pumpkin. 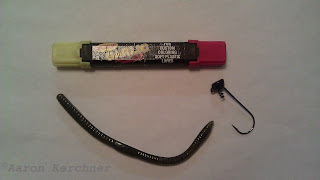 He placed it on a shaky head jig from Buckeye Lures, he followed that up with a Chartreuse marking pen on the tail to help trigger a strike. The combo worked well for him, as he placed first in the tournament. Xcite Baits was originally formed in Highlands Ranch Colorado, but has since moved to Texas. Thanks for the follow up. That was a tough tournament for sure, but we had such a good showing that we are trying to put together an entire NoMo season for next year. Keep an eye out for that. We'll be watching for the next NoMo Tournament, keep us updated!